The Houses of Parliament could have to be "abandoned" within 20 years without extensive repair work, Commons Speaker John Bercow has said. The Grade I-listed building suffers from flooding, contains a great deal of asbestos and has fire safety issues. 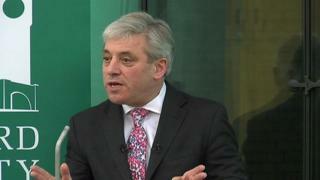 In a speech in Westminster, Mr Bercow said a £3bn repair bill was a "realistic scenario". If MPs and peers were to temporarily move out, locations outside London should be considered, he added. The Palace of Westminster - containing the House of Commons and House of Lords - is a Grade I-listed building much of which dates back to the 1840s and 1850s. Much of it has never been renovated, and the heating, water, draining and electrical systems are described as "extremely antiquated". A study in 2012 concluded "irreversible damage" would be done without extensive renovation work. Among the options put forward to carry out the work was a temporary closure, with MPs and peers meeting in an alternative venue. Speaking at an event organised by the Hansard Society, Mr Bercow said the "fabulous institution" must not "have the ethos of a museum". "It will require bold and imaginative managerial leadership to ensure that we are a Parliament fit for purpose and that this Victorian legacy can be rendered practical for contemporary representation," he said. Mr Bercow said it would be a "huge pity" if by the 200th anniversary of the fire that destroyed the old Palace of Westminster in 1834, "we had to abandon this site and look elsewhere in order to serve the public interest properly". He added: "Yet I will tell you in all candour that unless management of the very highest quality and a not inconsequential sum of public money are deployed on this estate over the next 10 years that will be the outcome." Taking questions afterwards, Mr Bercow said he was "very uneasy" about "decanting" Parliament to another building while repairs are carried out since "once you are out it can be very difficult to get back". But he added: "If we were to decant, should we consider all options including, almost certainly, a regional option? We should." Any decisions would have to be made by the whole House of Commons, Mr Bercow said, while the sums of money involved would require government funding. Lib Dem MP John Thurso, chair of the House of Commons Commission, said the Palace of Westminster was "really in a dire condition" and it was a "distinct possibility" that MPs and peers would have to move out while it was refurbished. "There are very serious problems throughout the Palace," he told Radio 4's World at One programme. "Simply patching it up to the minimal cost each year is no longer a viable option." While no-one yet knew what the work would cost, he said he believed there would be "an outcry" if such an iconic building was demolished or left to go to seed. The present building has had no general renovation since repairs of wartime damage were carried out between 1945 and 1950. Where could MPs go if Parliament is closed for repairs?